Nighttime snacking and junk food cravings may contribute to unhealthy eating behaviors and represent a potential link between poor sleep and obesity, according to the University of Arizona Health Sciences. Nighttime snacking and junk food cravings may contribute to unhealthy eating behaviors and represent a potential link between poor sleep and obesity, a study by University of Arizona Health Sciences sleep researchers stated. Recent results obtained by Finnish researchers from Turku PET Centre have revealed that eating leads to widespread opioid release in the brain, likely signalling feelings of satiety and pleasure. Eating a delicious pizza led to significant increase of pleasant feelings, whereas consumption of calorie-matched nutritional drink did not. However, both types of meals induced significant release of endogenous opioids in the brain. Opioids are associated with pleasure and euphoria. The study revealed that a significant amount of endorphins is released in the entire brain after eating the pizza and, surprisingly, even more are released after the consumption of the tasteless nutritional drink. The magnitude of the opioid release was independent of the pleasure associated with eating. According to the researchers, it is likely that the endogenous opioid system regulates both feelings of pleasure and satiety. – The opioid system regulates eating and appetite, and we have previously found that its dysfunctions are a hallmark of morbid obesity. The present results suggest that overeating may continuously overstimulate the opioid system, thus directly contributing to development of obesity. These findings open new opportunities for treating overeating and the development of obesity, says Professor Lauri Nummenmaa from Turku PET Centre. – It was a surprise that endorphins are released in the entire brain and that the nutritional drink had a larger impact. This creates a basis for future research and hopefully we will find ways to study and describe the development and predictors of addiction, obesity and eating disorders, says Researcher, M.D., PhD. Jetro Tuulari. The study was conducted using positron emission tomography (PET). The participants were injected with a radioactive compound binding to their brain’s opioid receptors. Radioactivity in the brain was measured three times with the PET camera: after a palatable meal (pizza), after a non-palatable meal (liquid meal) and after an overnight fast. As a person who has had a weight problem for much of his adult life, food choices loom large on my radar. I love snacking, pizza, cheeseburgers, you name the junk food, I likely love it. However, I weigh in the mid 150 pound area and have done so for the past seven years. What has worked for me is clearly thinking about what the food means to me in terms of my health. Not focusing on how good it is going to taste and how much I have always loved that flavor. I tie my action to its likely consequences. The clear goal of eating healthy has been my solution. These researchers have some interesting ideas to add to the discussion. Everyone knows that an apple per day is a more healthful option than a donut and yet, given the choice, many people would still choose the donut. A new study has revealed that food choices could be down to the associations that we make with food-related stimuli. Researchers explain why the urge to eat a donut is mightier than the urge to eat an apple — even though the apple is the more healthful option. Aukje Verhoeven, Sanne de Wit, and Poppy Watson, all psychologists at the University of Amsterdam in the Netherlands, conducted the research. Their findings were published in the journal Appetite. The consumption of unhealthful foods is on the rise around the world, which is contributing to the more than 1.9 billion adults who are overweight globally. Among children in the United States, more than 27 percent of calories each day come from snacks, including salted snacks, candy, desserts, and sweetened beverages. This could have hazardous consequences for their health. Government initiatives have focused on making people more aware of the adverse effects of eating unhealthfully. However, most people fail to adhere to the recommended food guidelines, and eating behaviors often remain unchanged. Though it is not clear why informational interventions do not work, evidence suggests that food-related stimuli in the environment may play a role in triggering unhealthful eating habits. I write often about the benefits the brain gets from exercise and how we should make regular exercise a priority as much for our mental health as physical. That is a good positive target. It turns out that WebMD also has some excellent suggestions for keeping our brains clicking on all cylinders, but they approach from the negative side. Not doing harmful things is also an important consideration in getting to old age with a fully functional brain. We really do have to pay attention to what our kids are consuming, both visually and by mouth. Sadly, they can form habits and develop food preferences in their youth that will damage them their entire lives. The fact that more than 80 pct of televised food ads are for unhealthy products is downright scary. Any parent who’s ever endured a whining child begging for that colorful box of cereal won’t be surprised by a new study’s findings: Children are more likely to eat junk food when they’ve seen ads for unhealthy foods and beverages. The new review included 29 past studies. There were more than 6,000 children involved in those studies. The researchers found that ads and other marketing for products high in sugar or salt have an immediate and major impact on youngsters. And children younger than age 8 might be most susceptible to junk food and beverage marketing, the study authors reported. The findings show the influence that such ads can have on children, said lead author Behnam Sadeghirad, a doctoral student at McMaster University in Ontario, Canada. I ran across two interesting infographics today that I thought you might enjoy reading. One is fresh and will help you to live longer, the other lasts forever, but will not help you to do the same. The first is watermelon whose season is near its end in these waning days of summer. 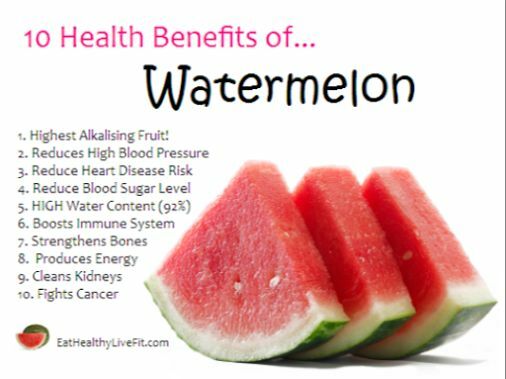 For the record, watermelon is one of my favorite foods. I eat some virtually every day of the year. I am fortunate that I have food markets here in Chicago that get watermelon sent up from Mexico in the winter months. I love its natural sweetness. 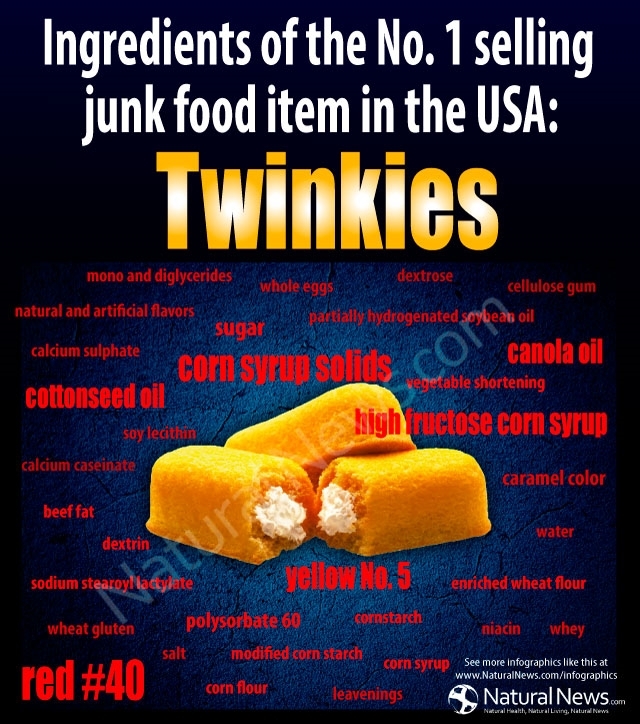 The second is about a non-health food: Twinkies which is never out of season because its shelf-life is infinite. I wrote a while back – A Love Letter to Hostess Ho-Ho’s and Twinkies – NOT. I don’t love its unnatural sweetness. This would be one of those one picture is worth a thousand words posts. Check out my Page – What’s Wrong with Soft Drinks? for more. Sometimes a simple reminder can work wonders when you are watching your weight go up. While these might jog your memory regarding the cost of silly snacking, don’t forget that you need to exercise as close to daily as you can. Your body and your brain need it. Check out my Page – Important Facts About Your Brain (and Exercise Benefits) to learn more. Back in 2012 when the Hostess baking company was possibly going under, I wrote A Love Letter to Hostess Ho Ho’s and Twinkies – NOT. That included a breakdown of what makes Hostess Ho Ho’s empty-caloried junk food. You can read mine and decide which is scarier, the Ho Ho’s or Twinkies. I put this in the category of one picture is worth a thousand words. I like the idea of connecting various parts of the body with individual foods and showing a relationship. 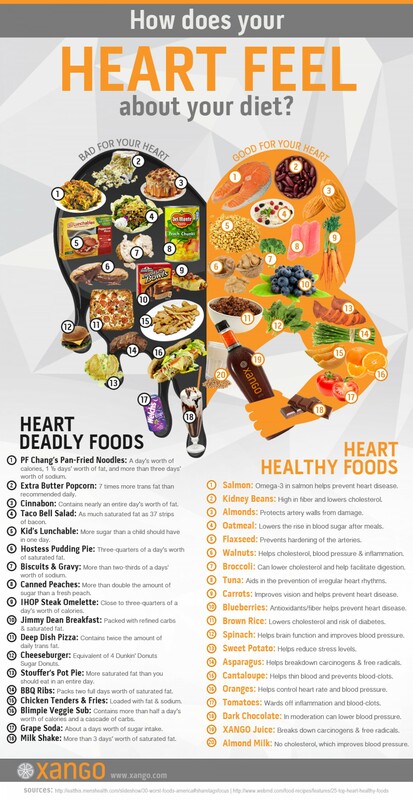 It is also interesting to note that there is no place for junk food on this chart. Not a lot of benefits there. It might be worth keeping in mind when you are tempted by a Ho Ho. I posted A Love Letter to Hostess Ho Ho’s – NOT a while back. 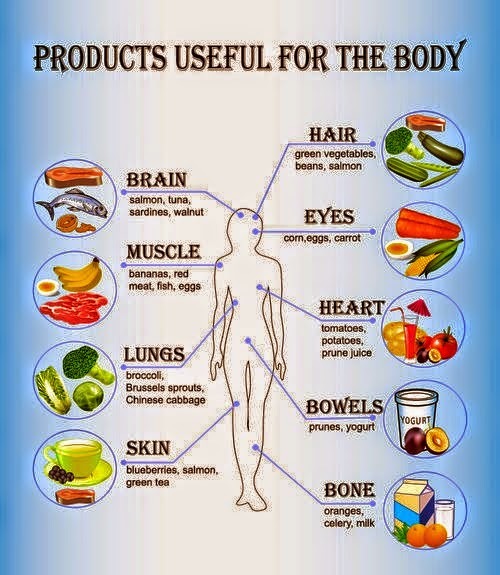 It has a good explanation of how certain nutrients impact your body. This picture is one of those Pinterest gag posts that people put on their ‘Funny’ pin boards. An ironic juxtaposition of two billboards. 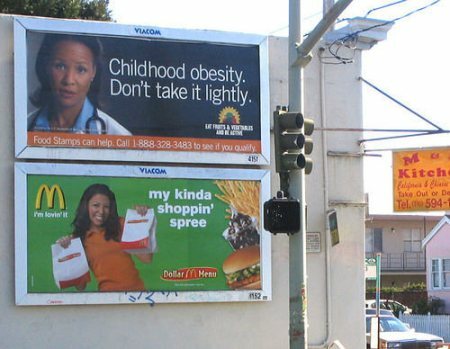 The top one warning about childhood obesity and the lower one trumpeting that king of burgers – McDonald’s. Obesity is not a joke. I don’t know how many times I have written “60 percent of us are overweight and 30 percent obese.” This is twice as many as 20 years ago. Even our children are getting fatter. Among young people, 15 percent of those ages 6 to 19 are seriously overweight. That’s nearly 9 million, triple the number of cancers that a person is vulnerable to. Also, a study published in 2013 by the National Academy of Orthopaedic Surgeons reported that the total number of knee replacement more than tripled between 1993 and 2009 more than tripled. They said the prevalence of overweight and obesity in the U.S. accounted for 95 percent of the higher demand for knee replacements, with younger patients affected to a greater degree. So, if you feel you ‘deserve a break today’ you might either miss McDonald’s or pick from their salad menu. When it comes to controlling our weight, a lot of people talk a good game, but the fact remains that 60 percent of us are overweight, 30 percent outright obese and adult onset diabetes is hitting our kids in their teens. So, we don’t do a very good job on controlling what we put into our systems. 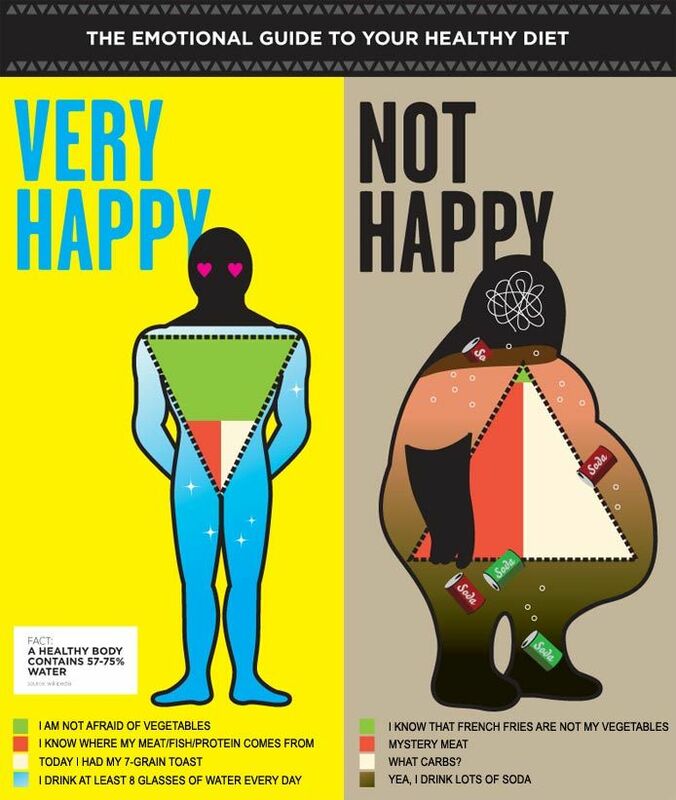 I thought this was a super infographic because it gets the reader to focus on what the impact of that slice of pizza is on his system. As I wrote on my Page How to Lose Weight – and Keep it Off – everything you eat and drink becomes a part of you. I firmly believe there is. Knowledge can set you free. As a former fat guy, I still often crave sugar as well as salty treats. I regularly snacked on chocolate and then potato chips when I was busy losing my battle of the bulge. Now I simply realize that I am doing myself no good by eating that good tasting stuff, but non-nutritious stuff. I understand the impact of those sugars, fats and salts on my body and choose not to cave to my cravings. As I wrote in How to lose weight – and keep it off, I know that everything I eat becomes a part of me. 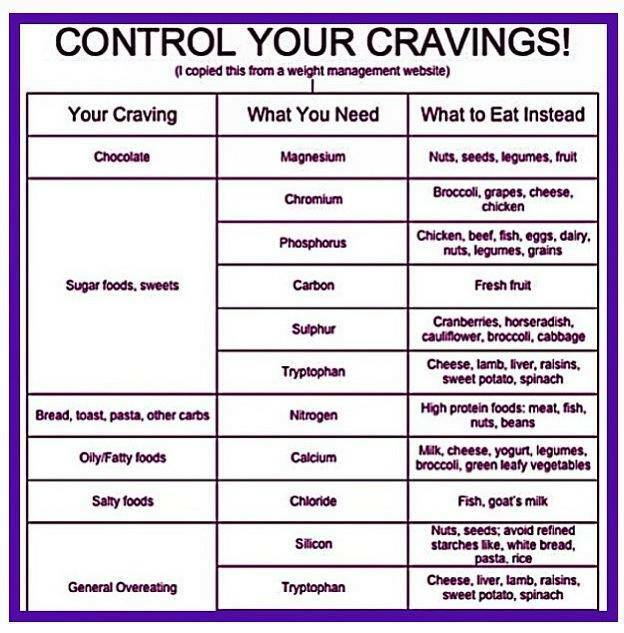 If that doesn’t work for you, perhaps understanding the source of your craving might be the key. Check out this list I picked up on the web that shows what minerals you are really needing when you reach for the junk. Good luck! It’s actually worse than this looks. As bad as these calorie costs are, they are computed for a 130 pound woman. If you are a 150 pound man add another 15 percent. What about Coca-Cola’s Anti-Obesity Ad? Having written some strong words of warning on sugary soft drinks as well as chemical-laden diet soft drinks, not to mention the scourge of obesity, what to make of Coca-Cola’s Anti-Obesity ads? Some facts first, 60 percent of us are overweight and 30 percent of us are outright obese. We have teenagers coming down with adult onset diabetes. We are the first generation of people starving ourselves to death in obese bodies. 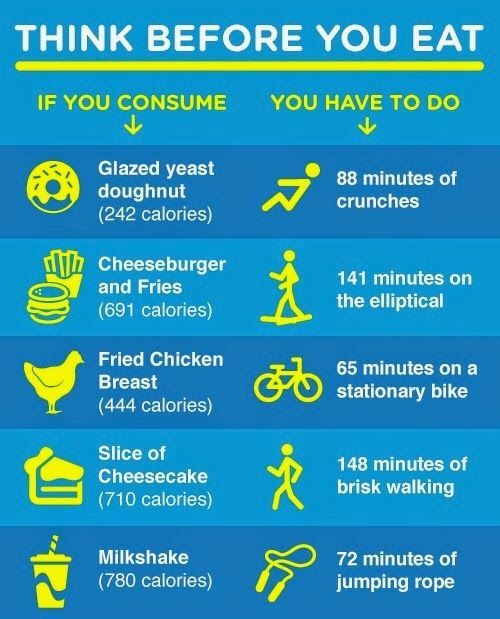 We gain weight when we take in more calories than we burn off. The Center for Science in the Public Interest says that soda contributes six percent of the total calories in our diets. That is more than anything we eat or drink. So soda is a major player in the obesity crisis. I was not able to get a copy of the Coke ad to run with this post, but I did find this “Honest” version which carries the original video but has a fresh new voiceover. The source is listed as John Pemberton which by no small coincidence happens to be the name of the pharmacist who invented Coca-Cola. Back to the headline. What about Coke having an anti-obesity ad? Why not? Anything that raises people’s awareness of the problem seems to be a step in the right direction. I don’t think the coke ad will encourage people to drink more of it. I certainly hope not. Here is a nice CNN discussion on it. To read more on the nature of empty calories and junk food check out my posts A Love Letter to Hostess Ho Ho’s and Twinkies – NOT also What are The Dangers of a Big Waistline? As regular readers know, I don’t drink sugary or diet soft drinks and consider them some of the most damaging junk foods available. A Nashville family’s rap video is the winner of a contest aimed aimed at raising awareness of the harmful health effects of overconsumption of sugary drinks. The winning video “Just Pour One Out” features an original rap song from the Sullivan family, inspired by 41-year-old stay-at-home dad Peter Sullivan’s personal struggle with soda consumption. “I was surprised by how much the process changed my drinking habits,” Sullivan said of making the film. Announced by the nonprofit Center for Science in the Public Interest in October 2012, the Pour One Out video contest invited the public to produce short videos demonstrating the pouring out of sugary drinks in a creative way. Advertising pioneer Alex Bogusky joined CSPI staff in judging contest entries based on creativity, originality, and effectiveness of the health message. CSPI offered a $1,000 prize for the winning film, and $500 and $250 prizes for the second- and third-place films.